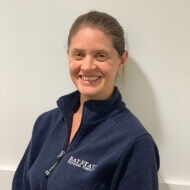 Stacy has almost twenty years of experience working in the outpatient orthopedic setting and has worked for Bay State Physical Therapy since 2002. Her interests lie in all aspects of orthopedics, but she especially enjoys working with patients who are recovering from surgery. She is a certified sports and conditioning specialist and uses this knowledge when working with athletes to return them to their sport. Stacy is married with two small children. She is frequently seen at local road races providing stretching and advice to runners.